Certificate of authentication is included and the print is signed and numbered. Print of Durham Cathedral a pencil drawing. Durham Cathedral is one of the great buildings of Europe. Set grandly on a rocky promontory next to the Castle with the medieval city huddled below and the river sweeping round. Durham cathedral is a World Heritage Site. The scene used by Claude Buckle is probably the most popular view of the cathedral, set off by the river Wear and the high stone work promontory. It is taken from across the river opposite the Cornmill. 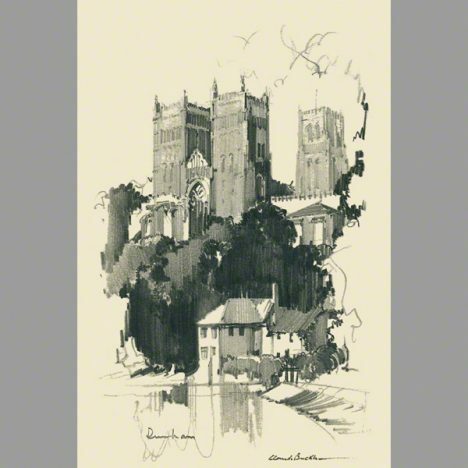 This Giclee print was most probably a railway poster proposal and most beautifully captures the scene showing the river in the foreground and the Cathedral in the background.